The Rosin fireplace system was scientifically developed in Europe. It debuted from the laboratory as the Bellfires™ fireplace by Mr. Bell of England, a contemporary of Dr. Rosin. It was commonly used to heat the complete home until the Second World War. Since then it has been further developed by using more modern aerodynamic concepts and thermal insulation techniques to improve the design. The Bellfires® fireplace is essentially a firebox composed of three components, all pre-cast in refractory materials. 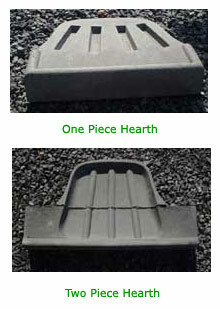 These components are the fireback, the hearth, and the side flares. The unit is designed in a half-pear shape in order to give the greatest efficiency possible. In new construction or a complete retrofit with a full stainless steel chimney liner, there is a fourth component added that provides the system with a performance rating comparable to many of today's high-tech woodstoves. 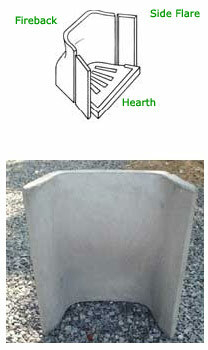 This fourth component is a stainless-steel or refractory dome fitted with an adjustable chimney-top mounted damper. 1. The half-pear shape design ensures a smoke-free home environment. Very little air is required to maintain a clean bright fire that results in little heat loss from the house up the chimney, and a draft-free room. 2. Minimal draft in the room means more than twice the heat and half the waste of a conventional fireplace. The result is a high overall efficiency rating and low emissions. 3. The half-pear design radiates and reflects heat back into the room and the fire. The Bellfires® burns wood better, easier, and more completely than the conventional fireplace. Radiant heat leaving the Bellfires® firebox has been measured in excess of 450ºF and room temperature increases of 15º within one hour are not an uncommon occurrence. 4. The Bellfires® will use at least 50% less wood than the common masonry fireplace, and if "banked" right will radiate heat overnight and hold enough hot coals to be rekindled the next morning. 5. No electrical fans are required to drive the heat into the room. This conserves electricity while providing the same kind of radiant warmth that we get from the sun. a) The Bellfires® liner is the only insert that does not alter the aesthetics of the open fireplace. b) The Bellfires® liner fits most fireplaces. c) The Bellfires® can be installed economically. d) The insulated refractory material radiates heat much better than metal and retains heat much longer after the fire is out.